All Bio-Light models are scientifically calibrated to counteract the daylight deprivation of dark winters, shift work and indoor working conditions. Dimensions: 12" X 24" X 3½"
Dimensions: 11.5" X 18" X 4.5"
Natural light normally regulates our internal biological clocks which control our alertness and energy. When dim indoor lighting, dark winters or shift work disrupt our body clocks, our bodies get out of sync, causing lethargy and moodiness. Light deprivation is usually due to the short days and long nights of winter. Insufficient light may also be the result of indoor working conditions, health and age related indoor confinement, or unseasonably cloudy weather. 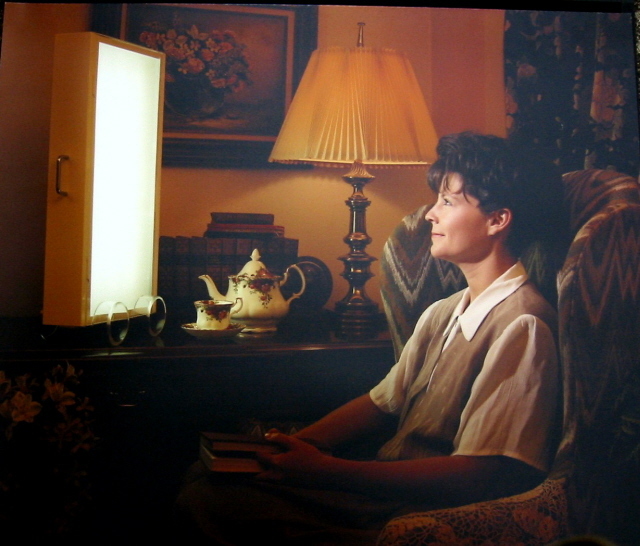 Leading medical centers worldwide recommend bright light boxes for the depressive effects of winter, sleep disorders, insomnia, shiftwork and PMS. Bio-Lights are research quality light boxes that simulate daylight and its positive, regulating effect on the human body. Bio-Lights are designed to meet the specifications researchers have found necessary to regulate body rhythms. Bio-Lights use a unique combination of broad spectrum fluorescent tubes, quiet flicker free electronic ballasts, reflectors and diffusers to provide maximum light intensity, minimizing your treatment time and providing optimal visual comfort. All units are carefully calibrated and come with a chart showing the lux levels dispensed at specific distances from the unit. All Bio-Light models have 3 double tubes for a total of 6 strips of lights. This provides a much smoother and more comfortable light surface than light boxes that use only 2 tubes. Many of our competitors only use 2 tubes. Compare carefully. All Bio-Lights are scientifically calibrated to counteract the daylight deprivation of dark winters, shift work and indoor working conditions. 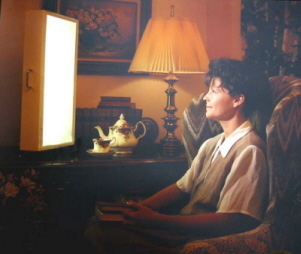 Leading medical centers worldwide recommend bright light boxes for the depressive effects of winter, sleep disorders, insomnia, shift work and PMS. Bio-Lights are research quality light boxes that simulate daylight and its positive, regulating effect on the human body. Bio-Lights are designed to meet the specifications researchers have found necessary to regulate body rhythms. Bio-Lights use a unique combination of broad spectrum fluorescent tubes, quiet flicker free electronic ballasts, reflectors and diffusers to provide maximum light intensity, minimizing your treatment time and providing optimal visual comfort. All units are carefully calibrated and come with a chart showing the lux levels dispensed at specific distances from the unit. DISCLAIMER: Enviro-Med cannot offer medical advice or recommend which individuals should receive light therapy for seasonal affective disorder, winter blues or other conditions. We advise that light therapy for seasonal affective disorder or other conditions be prescribed by a physician or other qualified health care professional and duration and timing supervised by the same. Consult with your physician to rule out any ophthalmological or other conditions that might preclude the use of light therapy.